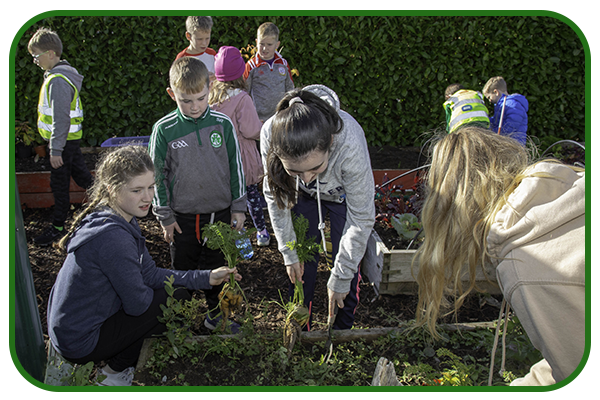 Click on these pdfs for the pages of an article concerning Ballon Community Garden in the Christmas edition of Irish Garden Magazine sent in by Maire. 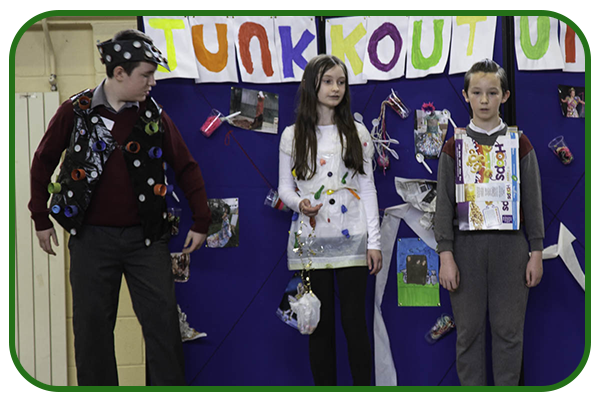 Bernie and Maire with Minister of the Environment Michael Ring. 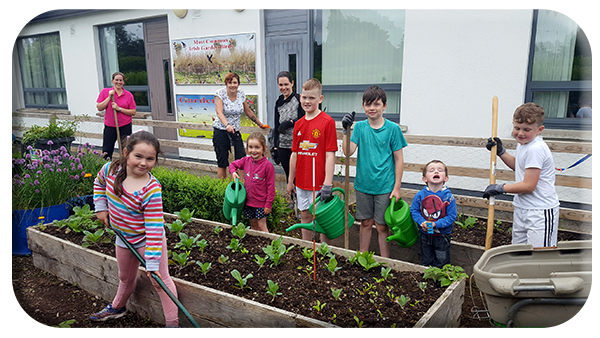 Ballon Improvement Group were delighted to welcome Fionnuala and Richard to the Community/School Organic Garden on Thursday. 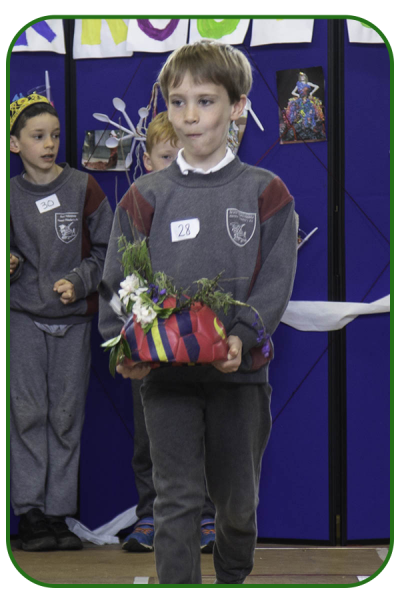 It was a very exciting and joyous occasion for the parents and children present. 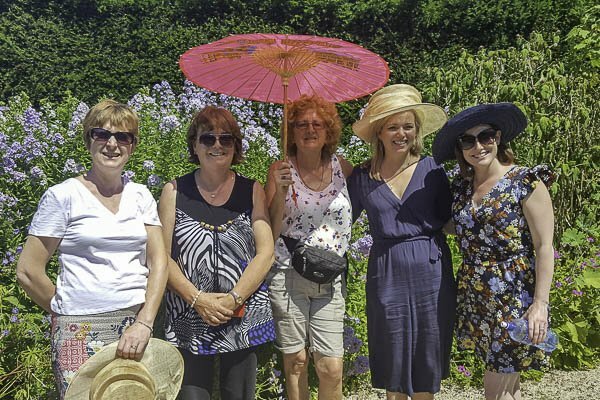 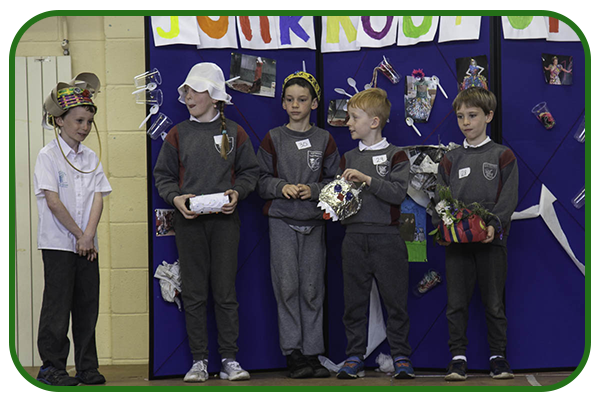 A mini reunion of past Ballon School Gardening Clubs took place as a curtain raiser to the main event. 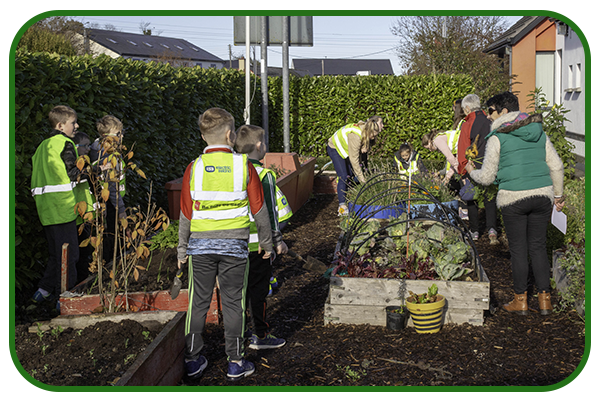 Irish Garden Magazine are featuring the Ballon Community Garden in the Christmas Edition. 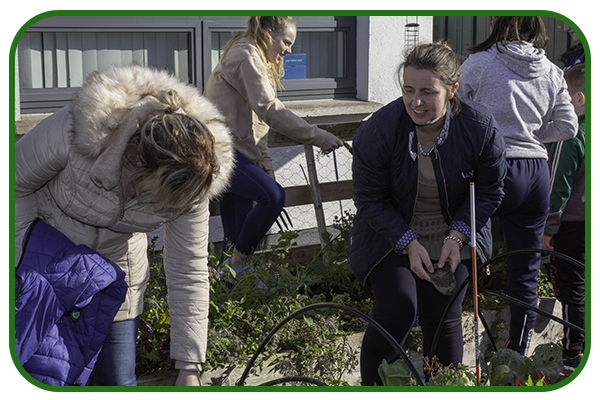 November Sunshine shone brightly as everyone chipped in and practiced their gardening skills. 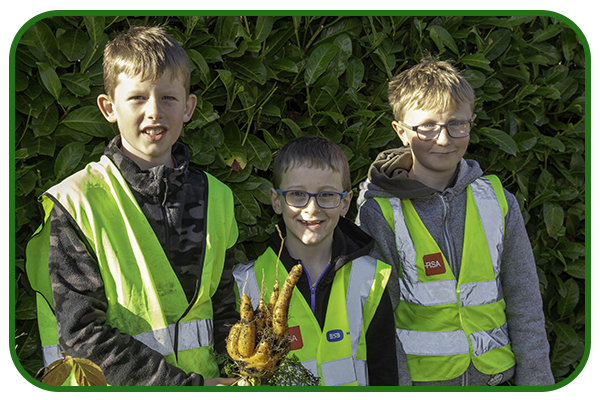 The last of the carrots were harvested and all were intrigued to discover and sample the heritage variety. 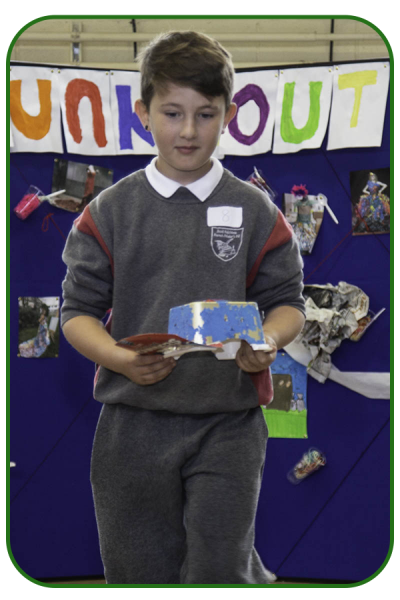 We look forward to the publication. 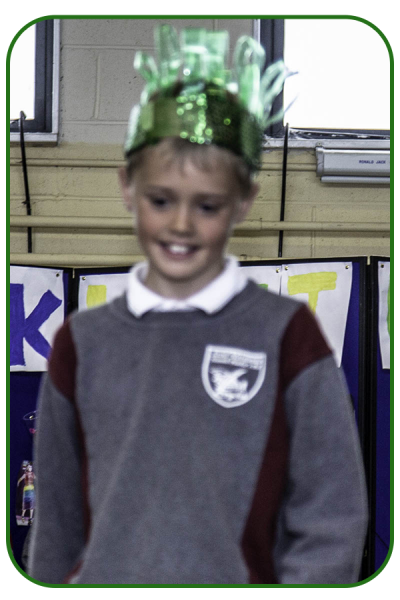 Thanks to all who came along and to Michael Martin our local Photographer and Webmaster. 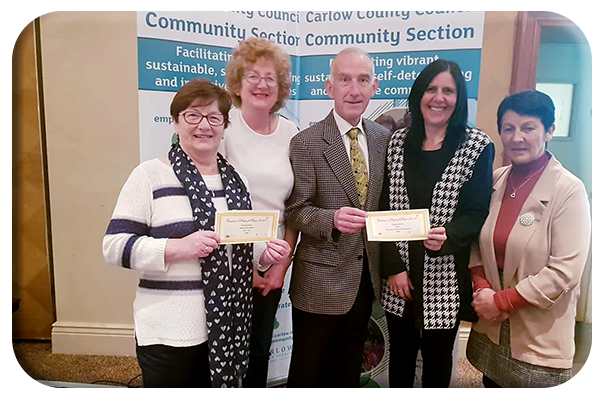 By Michael Dawson:- Ballon scooped four awards in this year’s Carlow Pride of Place competition, the results of which were announced at a function held Mount Wolseley Hotel on Wednesday 24 October. 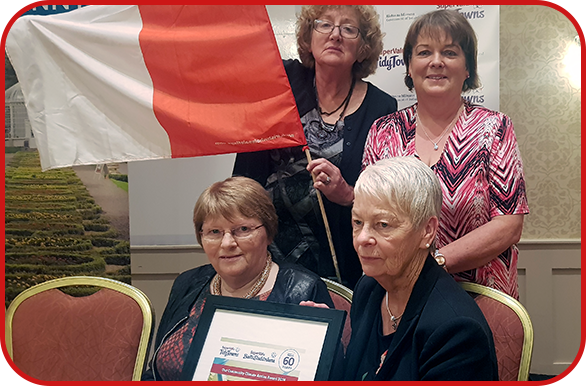 Ballon village, overall winners in 2012 and 2014, was placed second behind Clonegal in the community town and village section population 250 to 750. 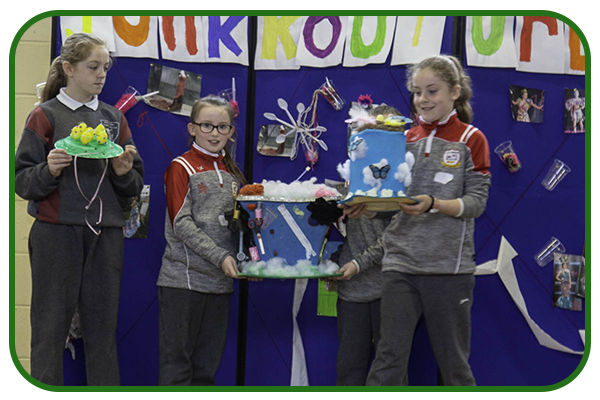 They won €400 for their endeavours. 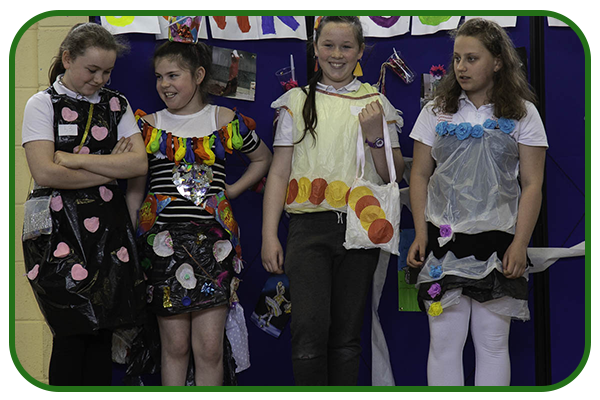 Ballon village, through the efforts of Ballon Improvement Group, entered this special competition sponsored by the Department of Communications, Climate Action and Environment. 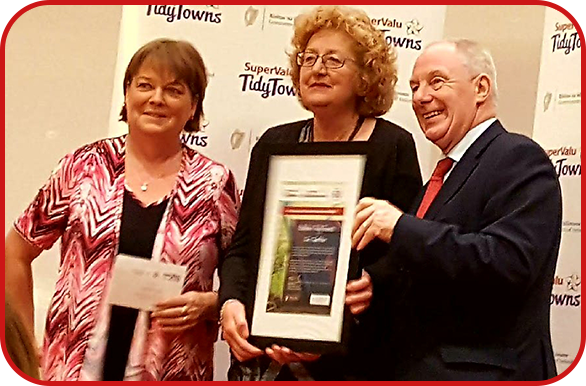 The overall aim of the Tidy Towns ‘Our Community Climate Action Award’ is to recognise the positive contribution local communities can make in addressing climate change through their Tidy Towns activities. 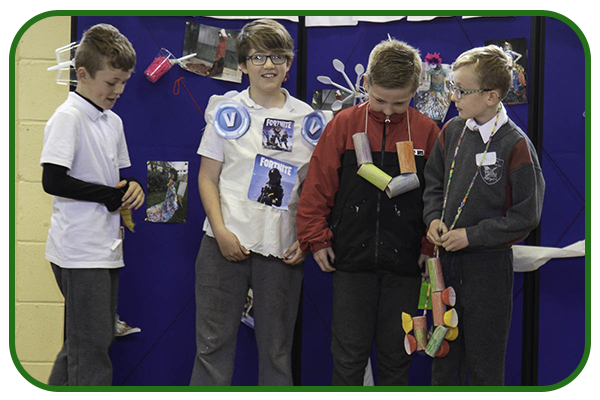 This was done with flair and imagination involving the school and local contributors all of which has been included on the village website. 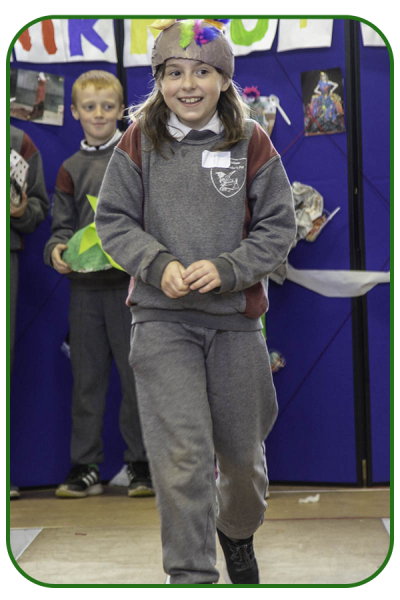 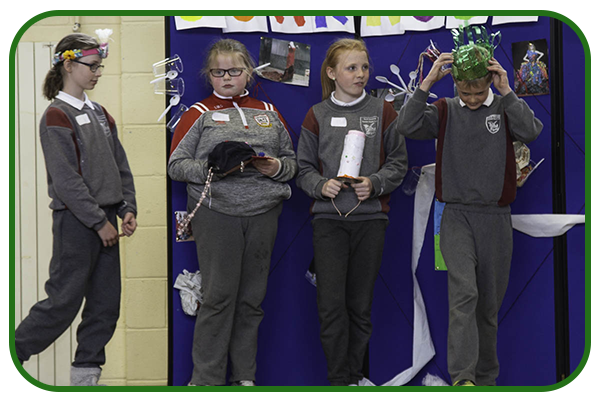 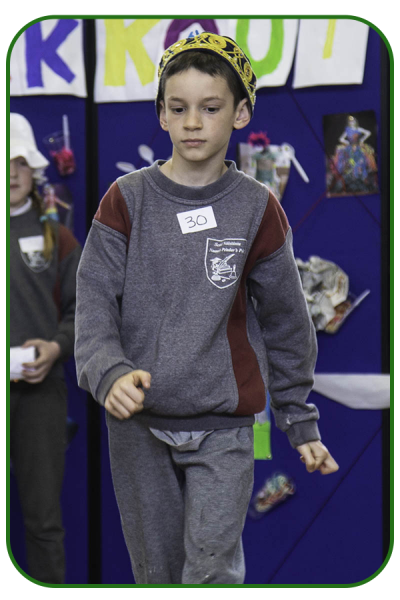 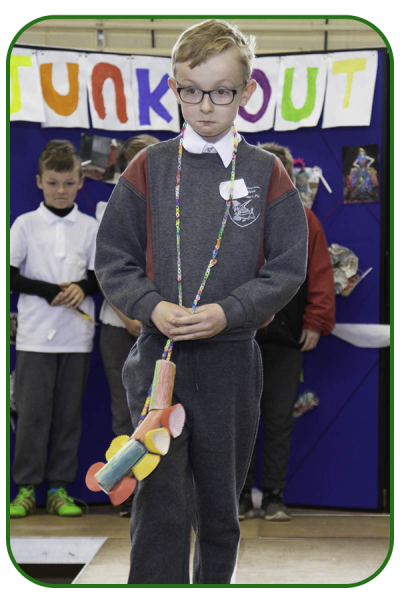 As a result of what they achieved and then reported on earned Ballon First Prize and a cheque for €2,250 announced at the Tidy Towns Awards Night. 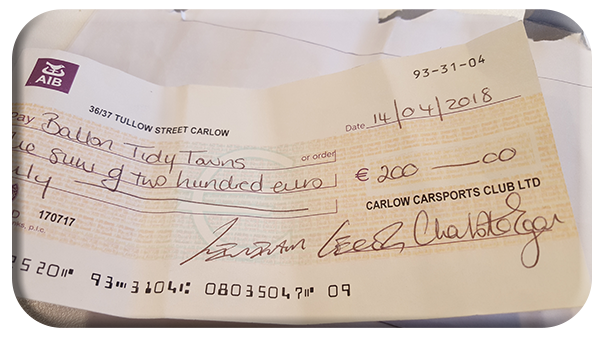 The report by BIG is an excellent example of quality penmanship. 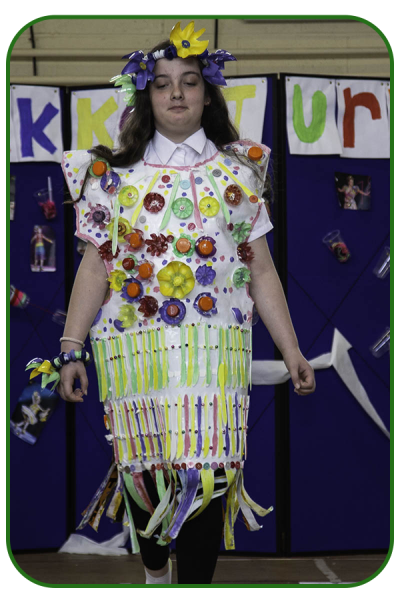 Click on the link below to get some idea of the wotk that’s gone ito this. 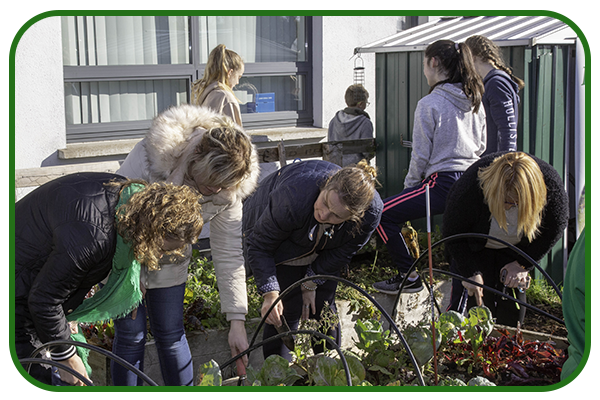 Thanks to all who came along last Saturday to the big clean up in the Organic Garden. 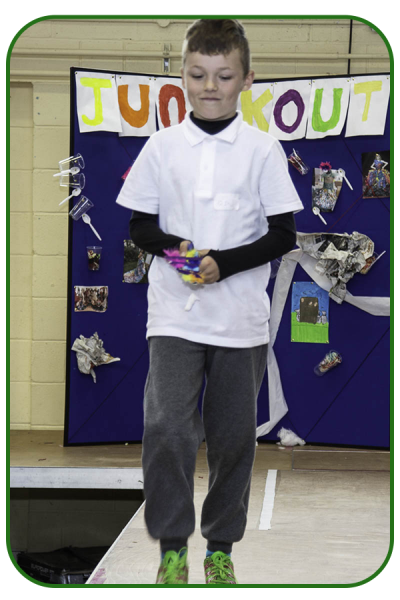 Another Saturday morning workout is planned for this coming Saturday 9th June.10am to 12am Everyone welcome. 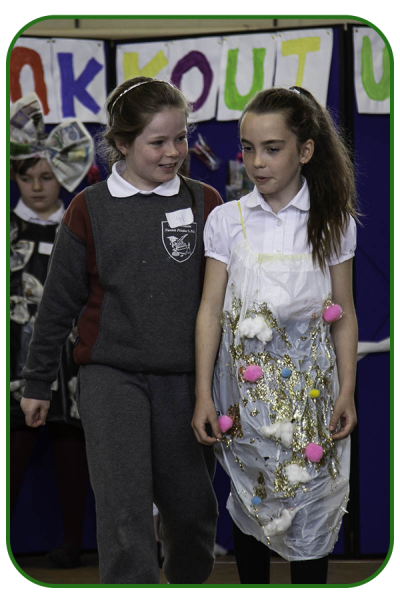 Go Green Expo was held at Ballon School on Friday the 11th May. 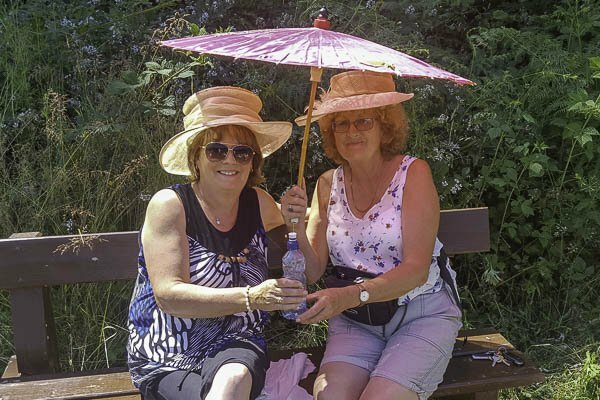 Weather was very inclement but the contingency plan worked a dream. 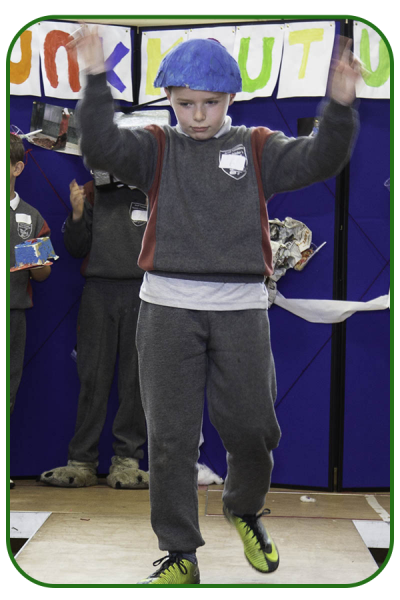 The pure excitement of all has to be contained as the first event of the day progressed. 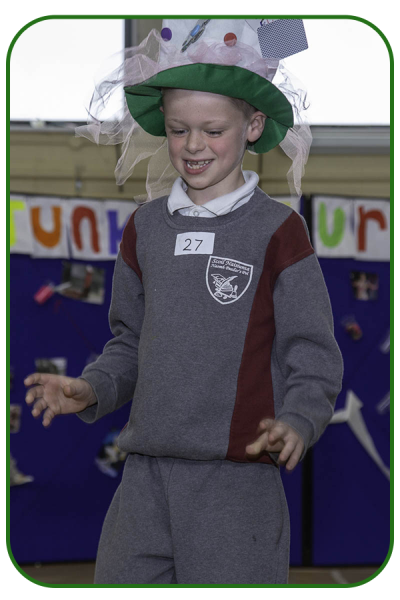 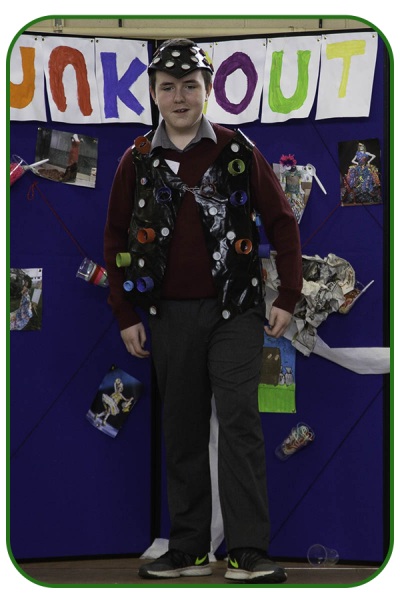 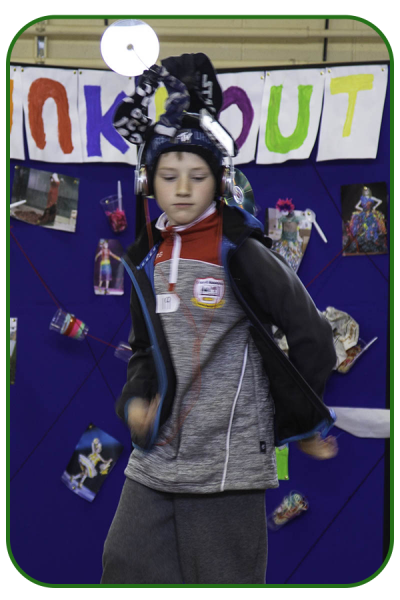 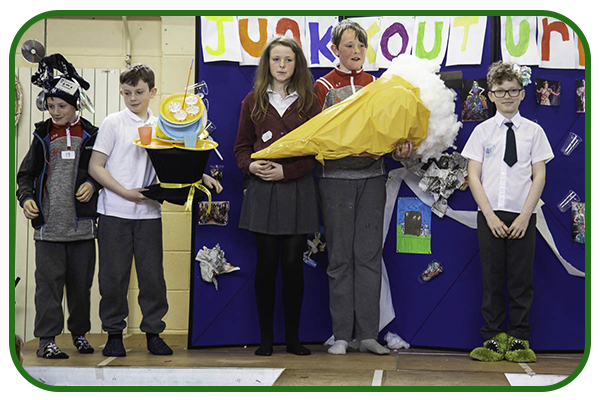 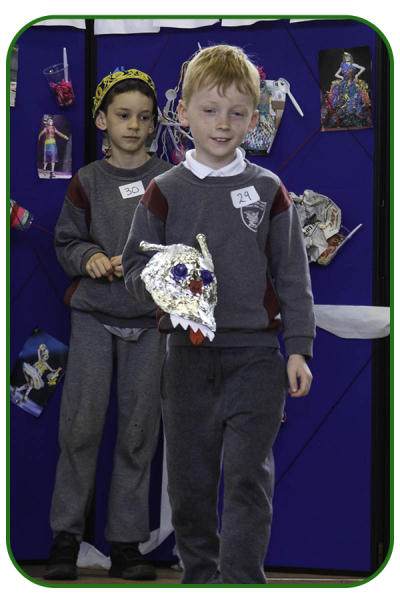 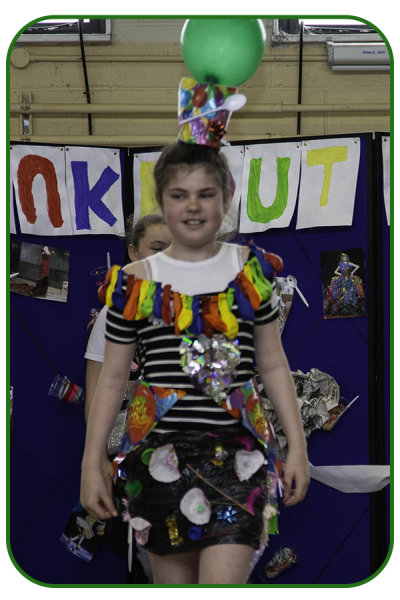 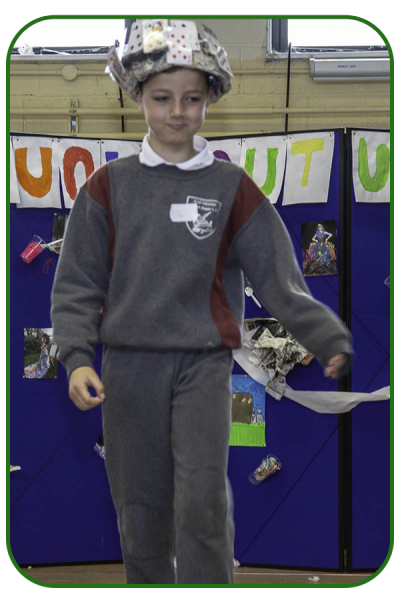 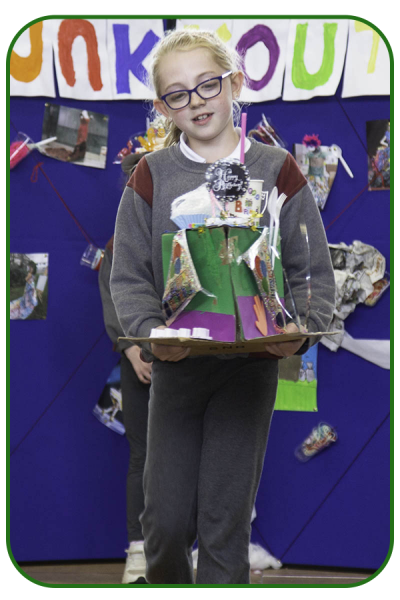 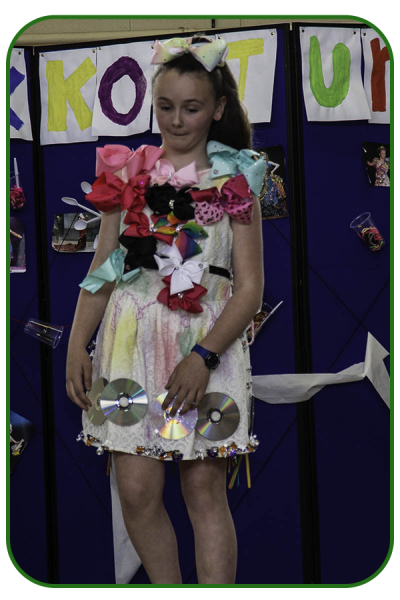 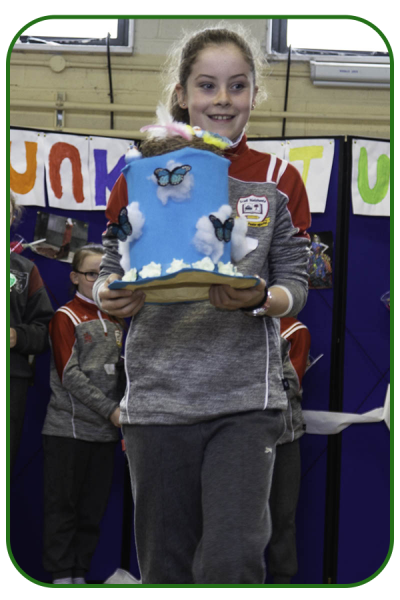 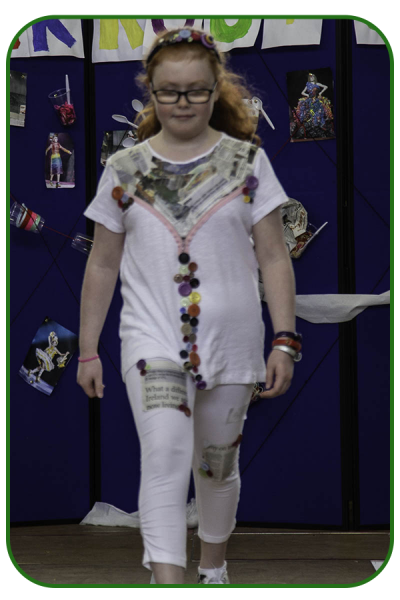 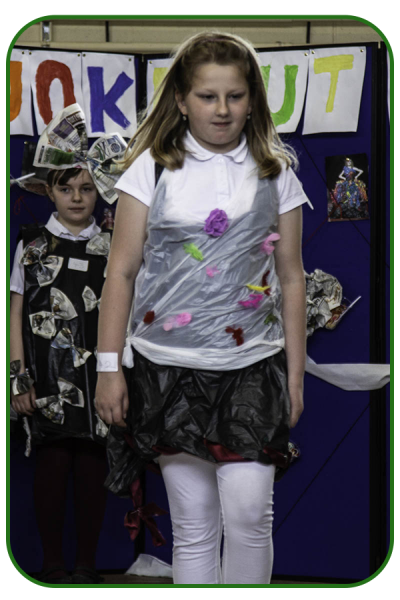 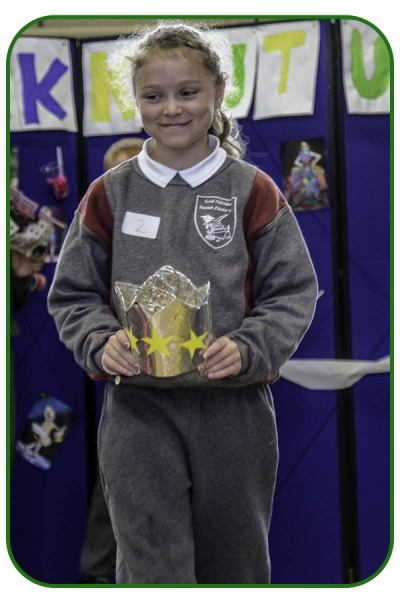 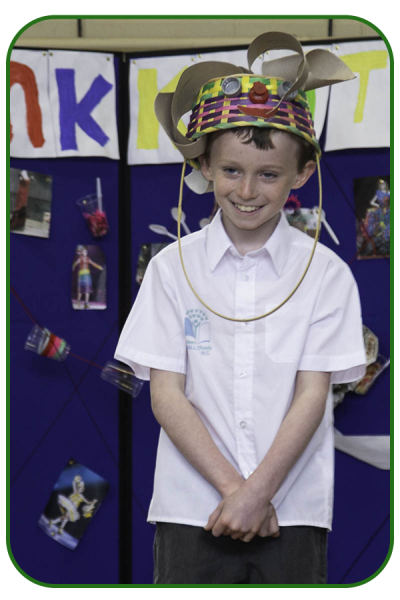 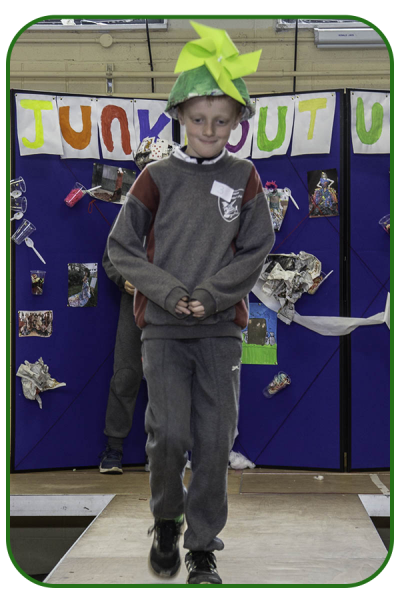 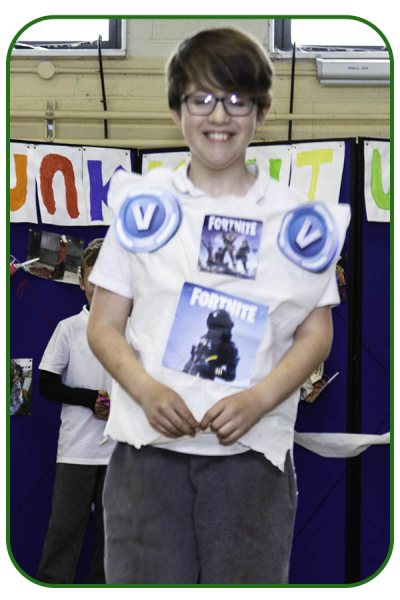 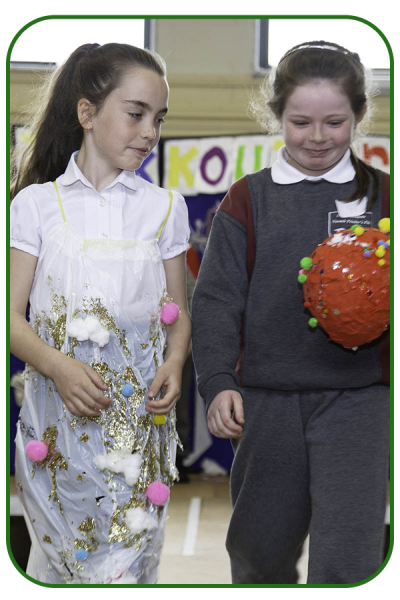 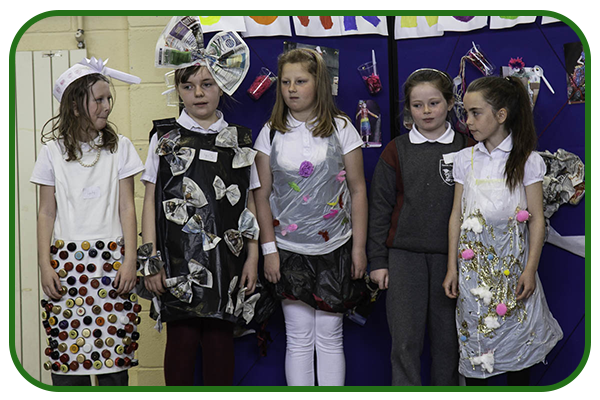 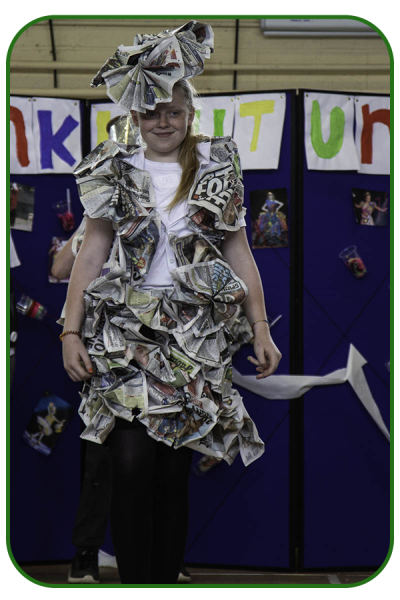 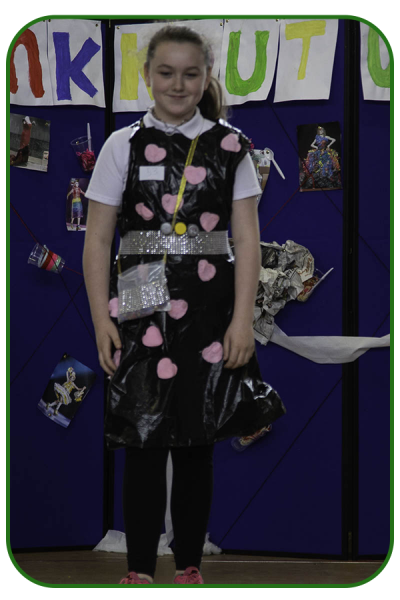 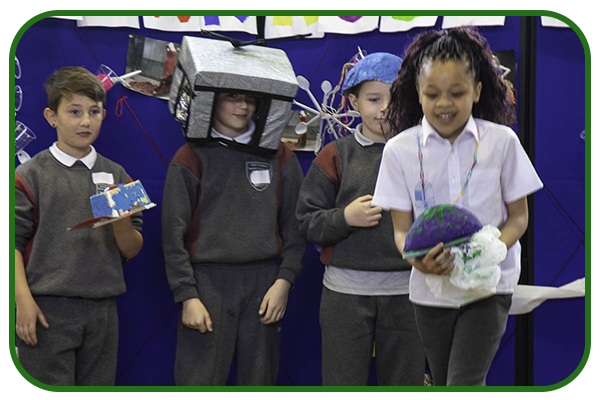 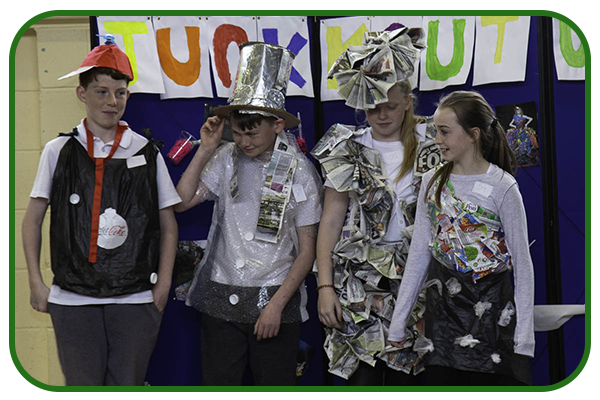 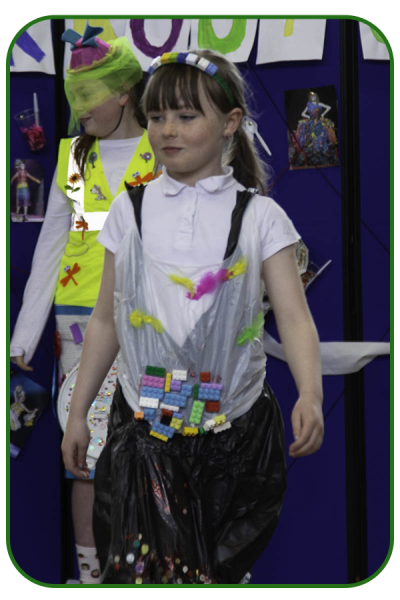 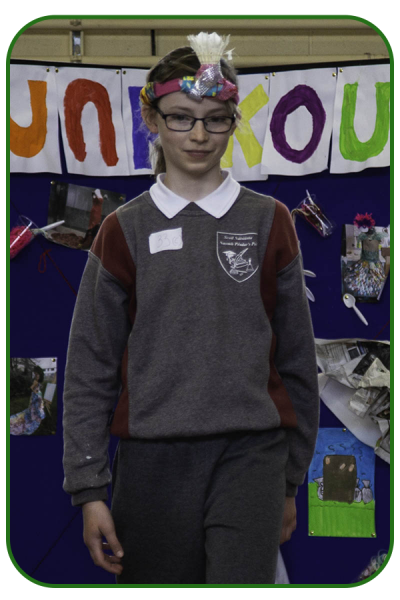 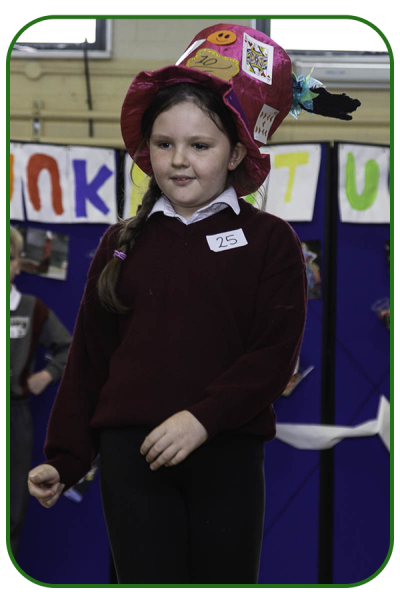 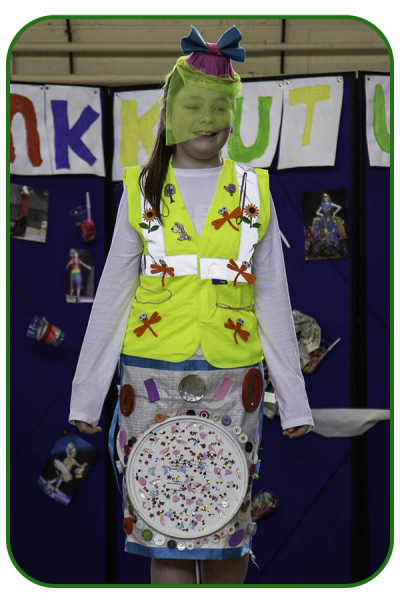 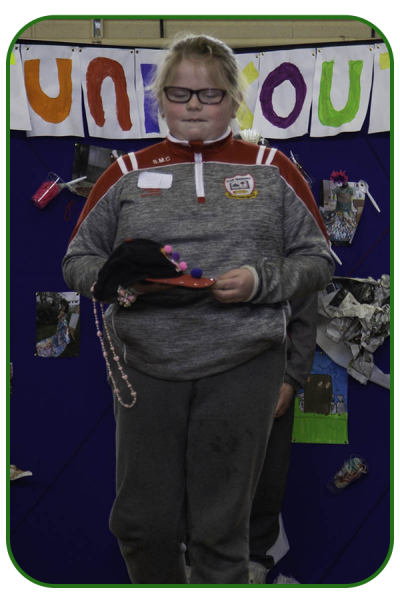 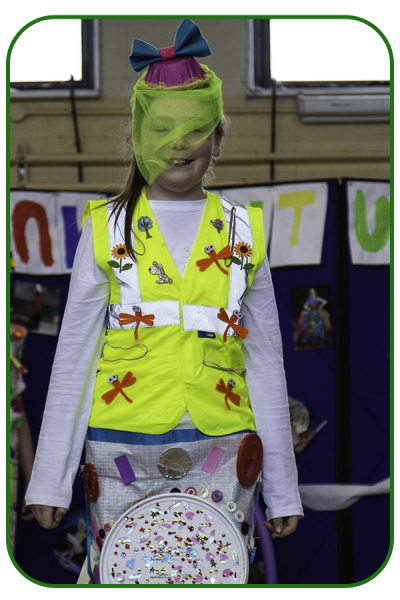 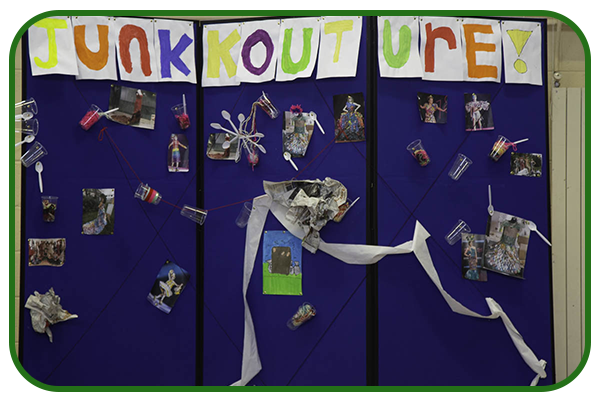 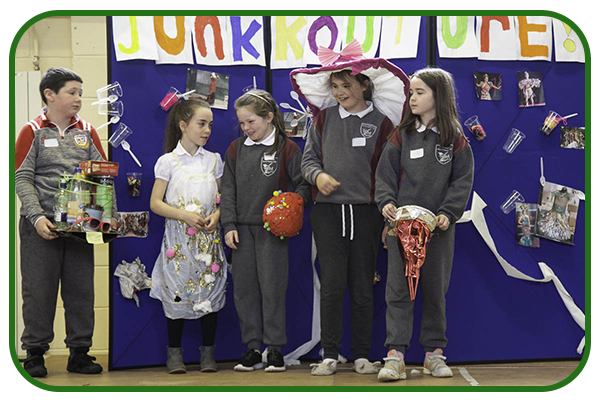 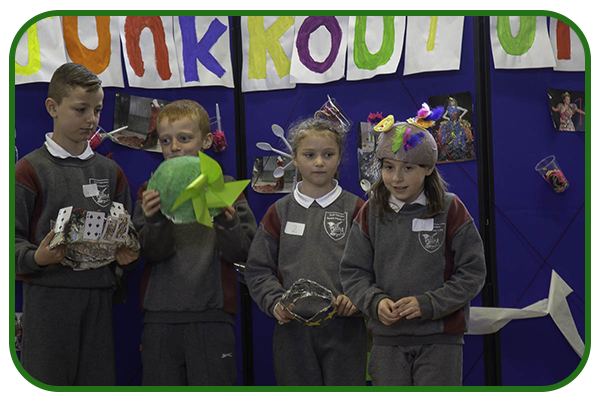 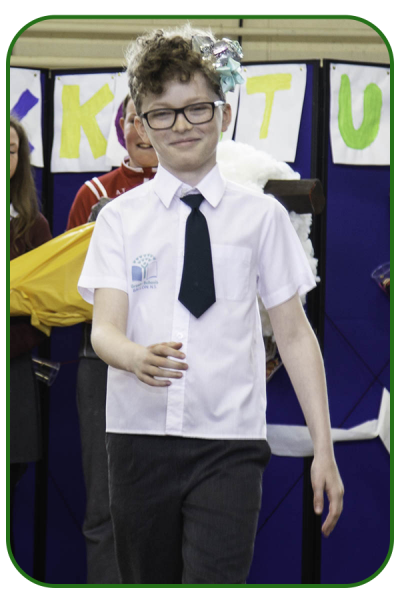 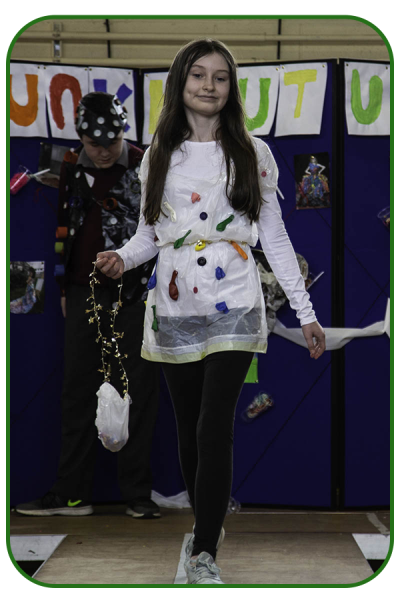 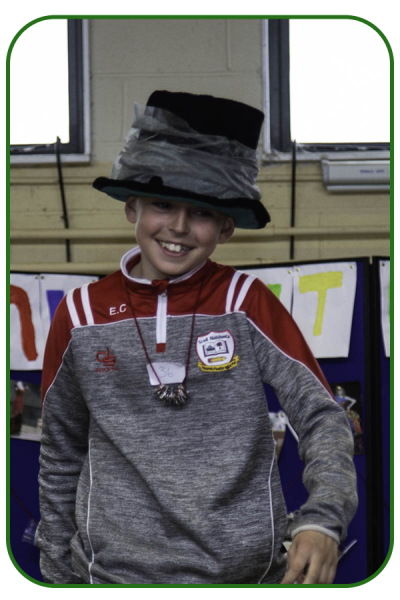 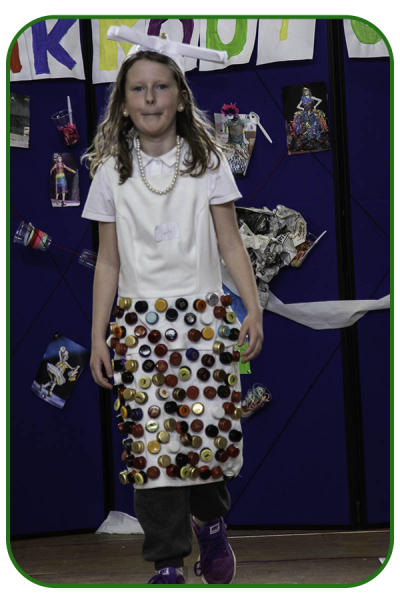 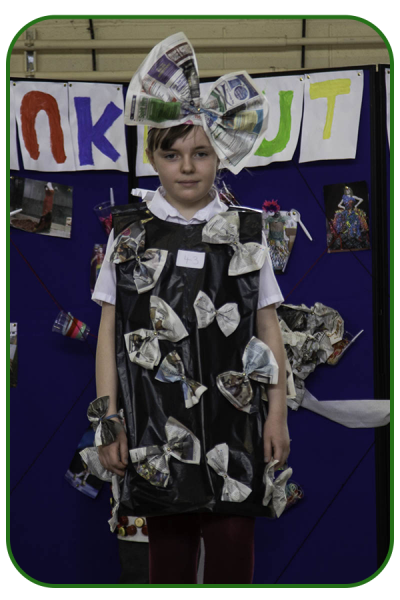 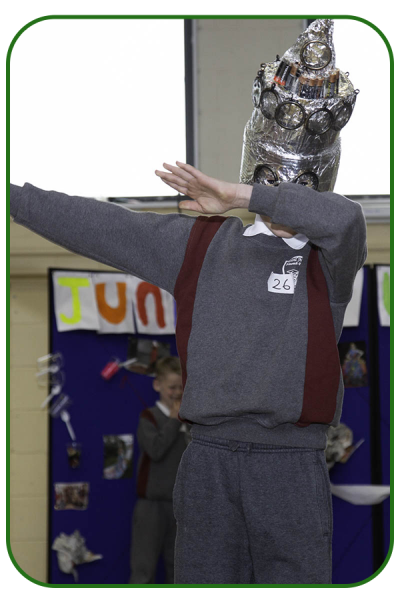 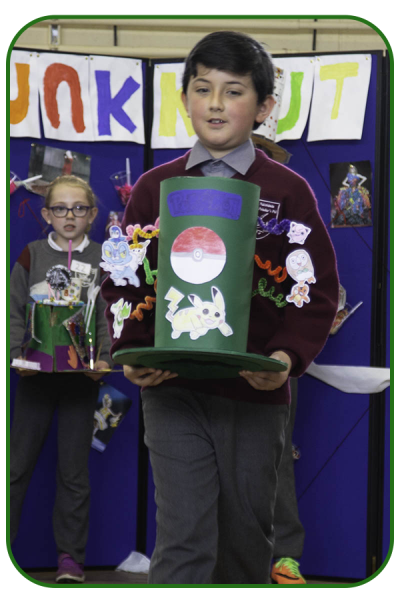 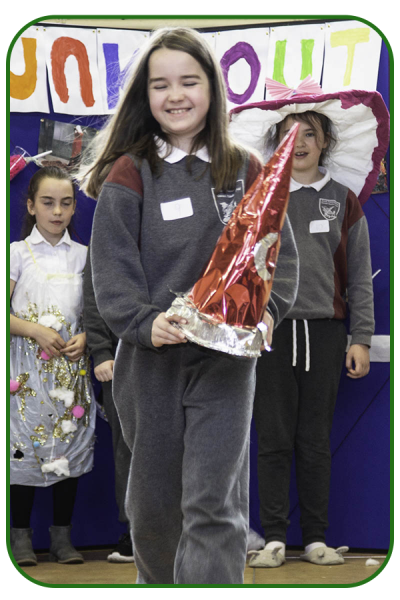 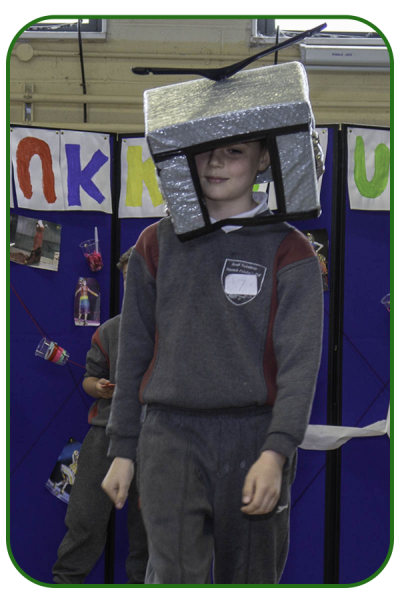 A ‘Junk Kouture ‘ fashion extravaganza showcasing the creativity of the children and their parents by using only items normally confined to the bins. 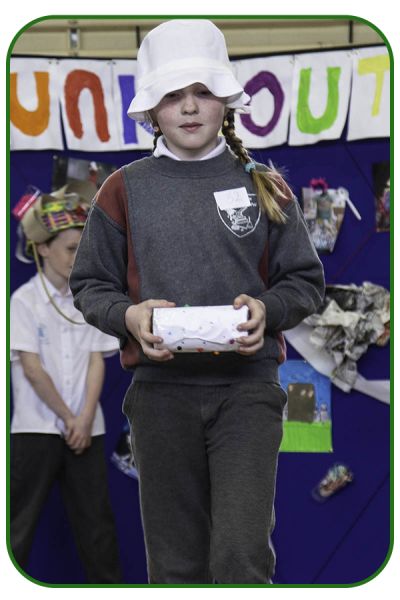 Teacher Una Murphy was production manager with school Caretaker Paul Cummins as stage and sound Engineer. 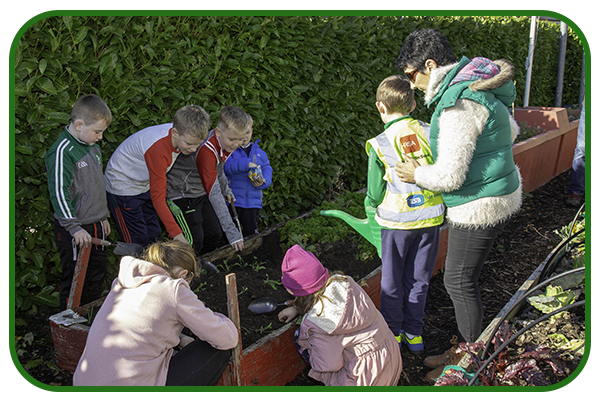 The grow your own vegetables campaign swung into action in the Agenda 21 Polytunnel and Facilitated by Tom Cox from Fenagh Tidy Town Group. 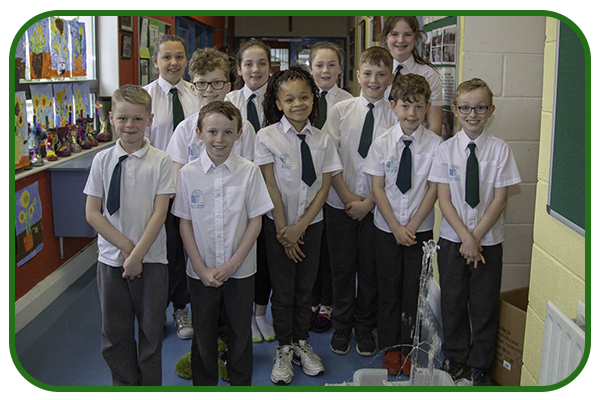 The junior Tidy Town Group, Green School Committee, and School Gardening Groups used the relay method and planted window boxes for flower displays in the village this summer. 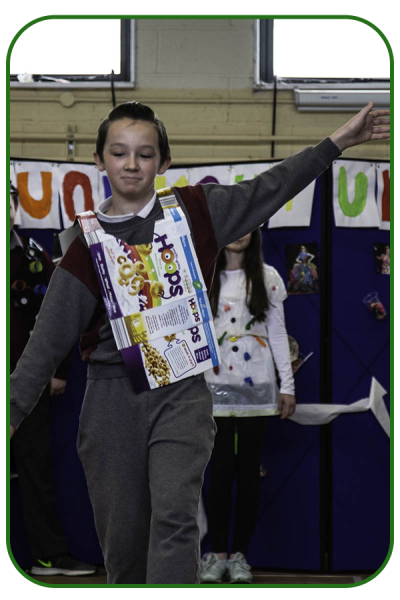 Leader here was Tom Rodgers of Cheetah aided by transition students Joe O Neill and Seamus Connolly. 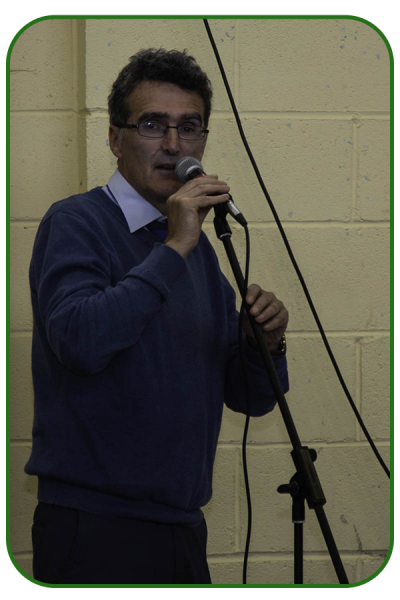 Back to the main arena again and Tom Malone of local Malone Fruit Farm took to the platform. 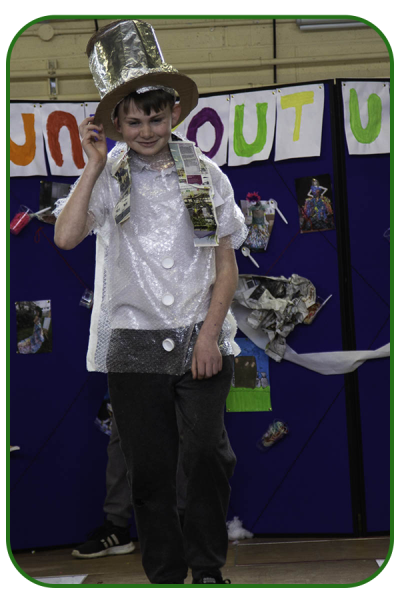 With huge interaction and audience participation Tom showed how to use up surplus fruit and vegetables by making your own chutney. 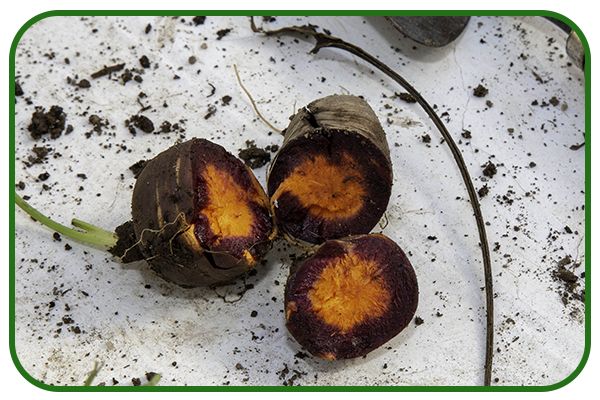 This is another idea to save on food waste and is very easy one. 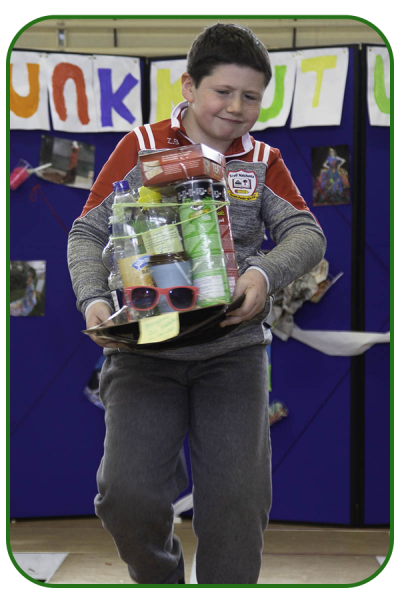 Buying local and eating local fruit and vegetables was promoted during the workshops. 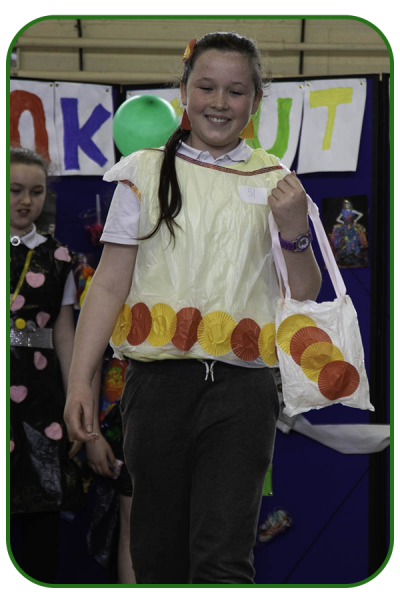 The indoor ECO BBQ was warmly welcomed. 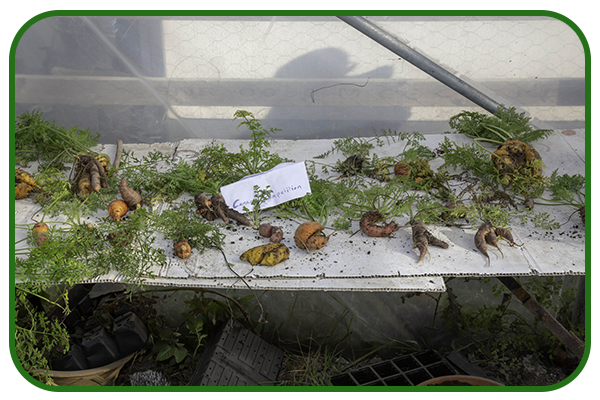 There was not one pick of waste food left by three pm. 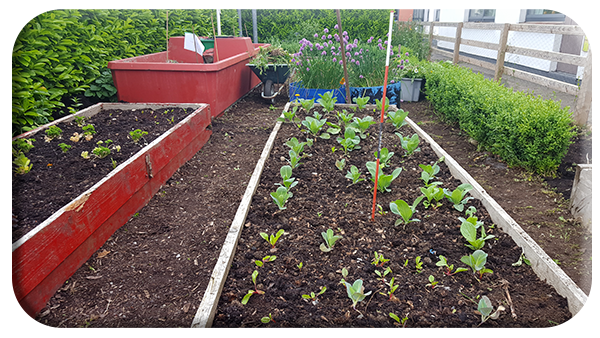 All the food was locally sourced. 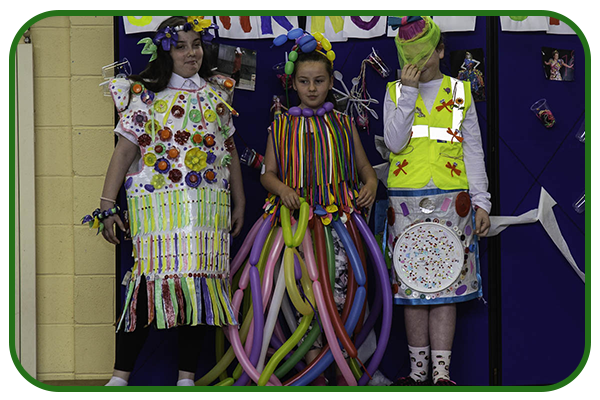 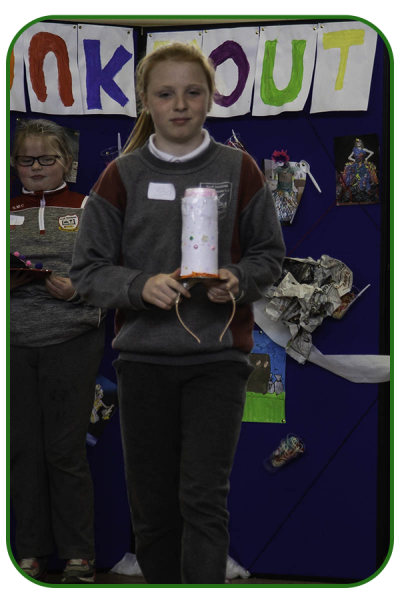 Kathleen and Sinead Abbey members of Ballon Tidy Town Group were the main helpers aided by Trish Moran our Siopa Glas Tus worker and the teachers. 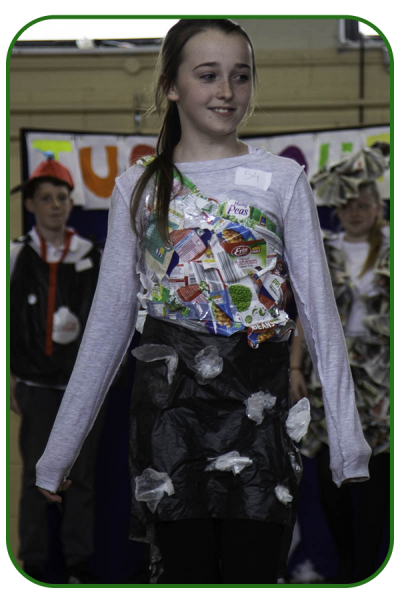 Next item on the programme was the Carlow Voice Ireland Ambassador Dee Sewel who explained and showed us what goes into your recycling bin. 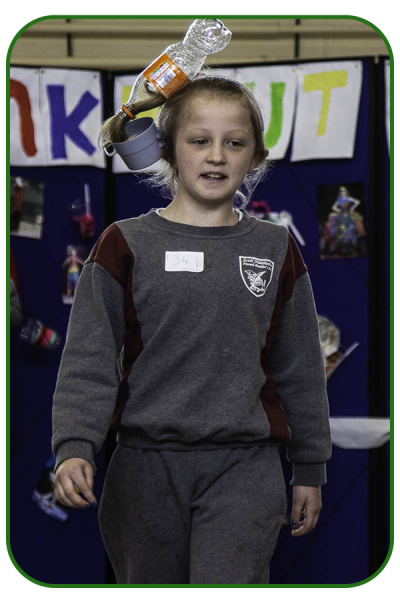 Great insight from this workshop and many questions answered. 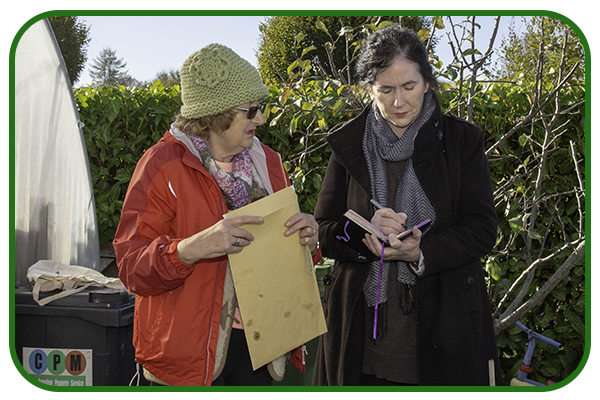 A survey of a sample of homes around Ballon is to be undertaken and will form part of a national survey. 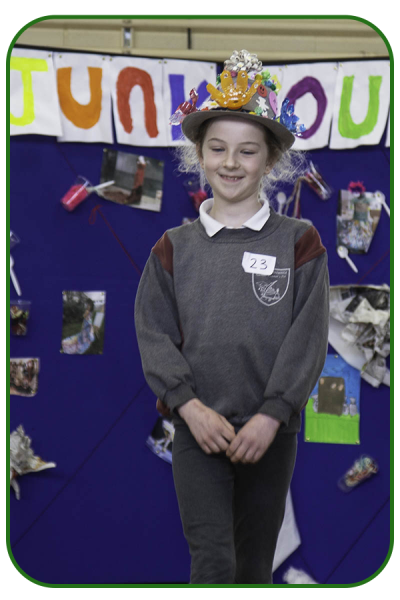 Dee also happens to be National Chairperson of Community Gardens of Ireland. 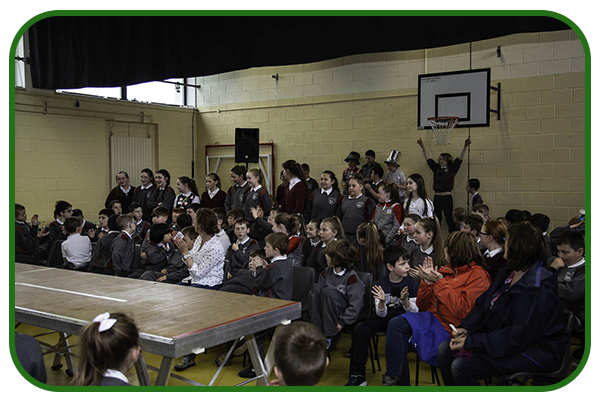 Drumming workshops were held in the Drumming Room with leader Tom Darcy. 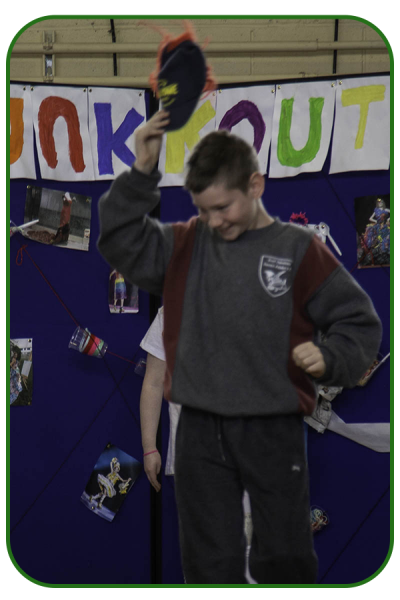 Many felt Drumming workshops could be held many times in the future and will be revisited. 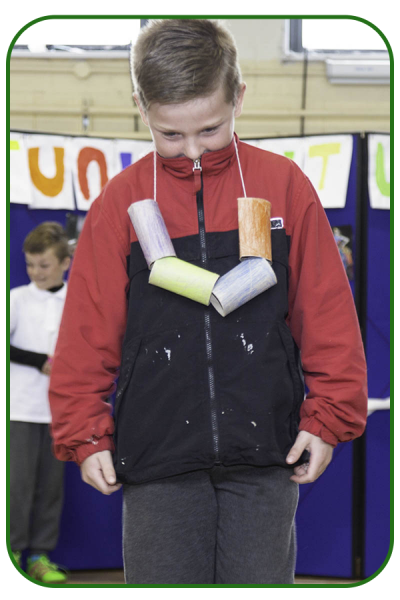 Eco friendly using just one’s arms and imagination. 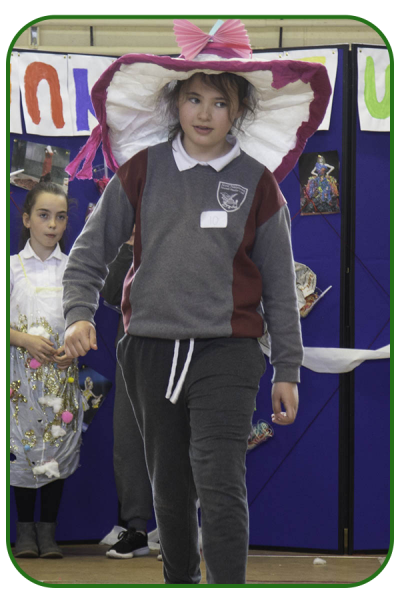 This great early Community Summer Festival was pure inspirational. 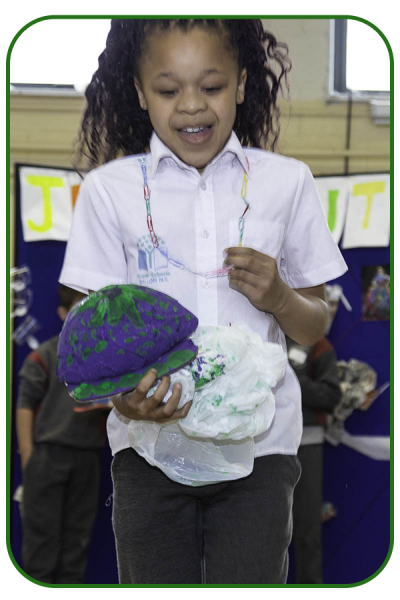 Ballon’s Go Green Expo event enabled the School and Community connection offer enjoyable forms of information and sharing to progress a sustainable lifestyle for school, work, play. 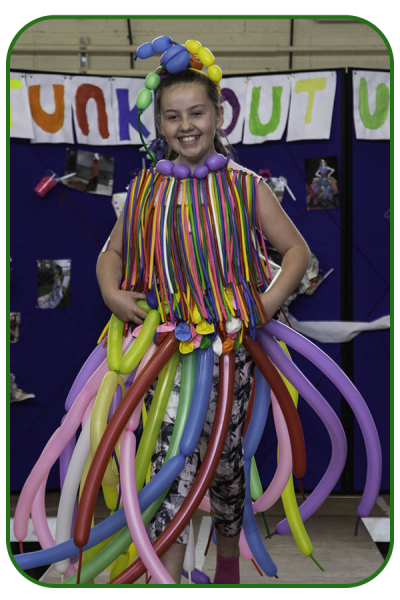 Great media coverage was provided by the Nationalist, Local newsletter, Facebook and www.ballonvillage.com etc. 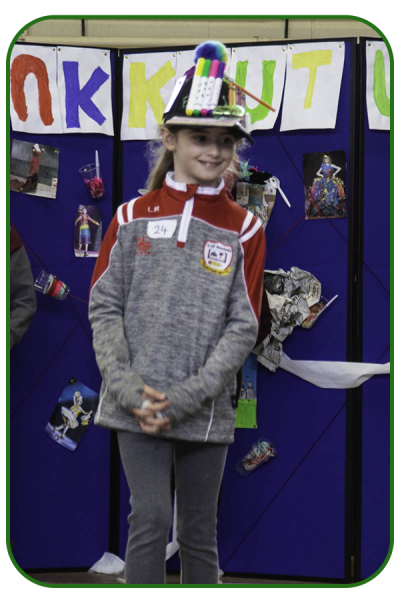 KCLR broadcast live from our event. 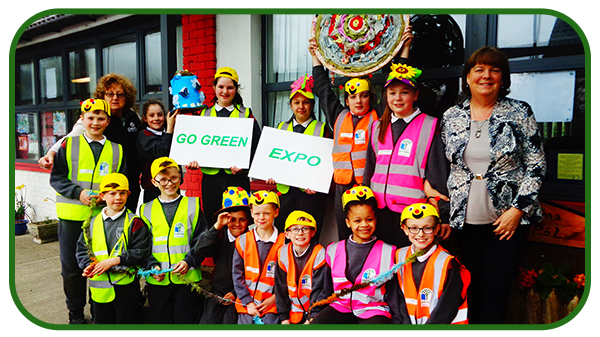 Edwina Grace of KCLR launched our two new actions for Going Green in our Community. 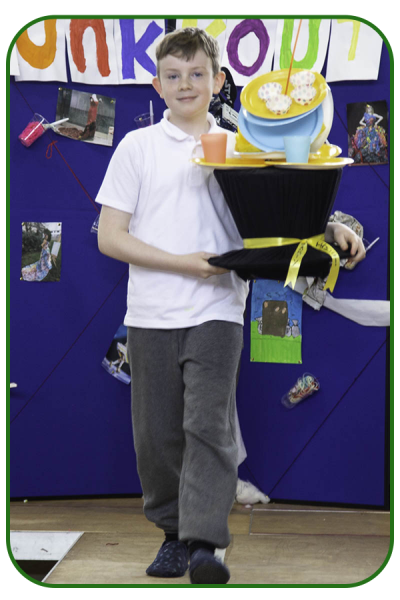 Ecoffee cup (more details to follow on this). 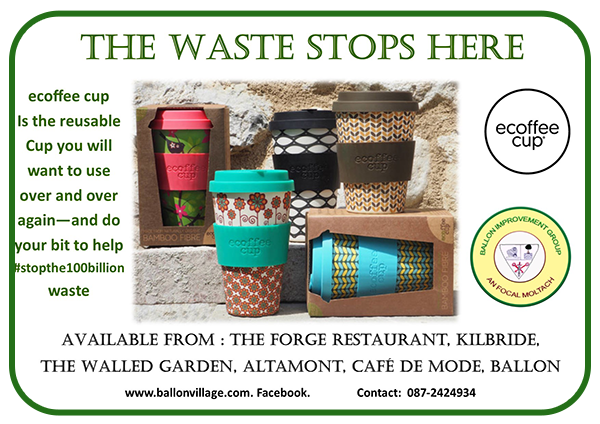 Billions of throwaway cups are dumped on to our roadways. 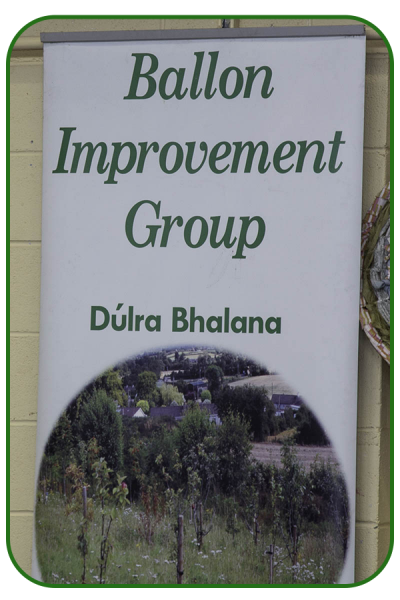 Water outlet is now in place outside Siopa Glas Community Recycling Store at Main St. Ballon for public use. 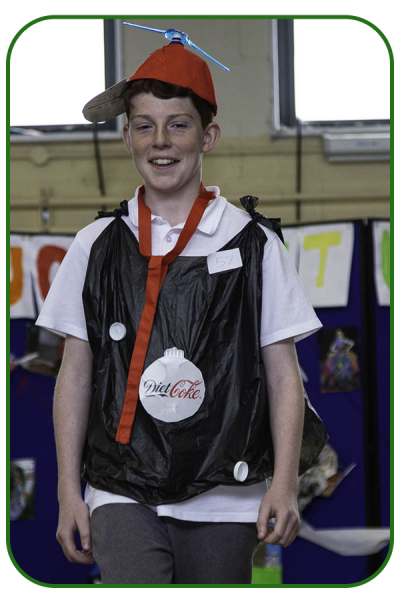 See www.refill.ie for further information on this action for the future. 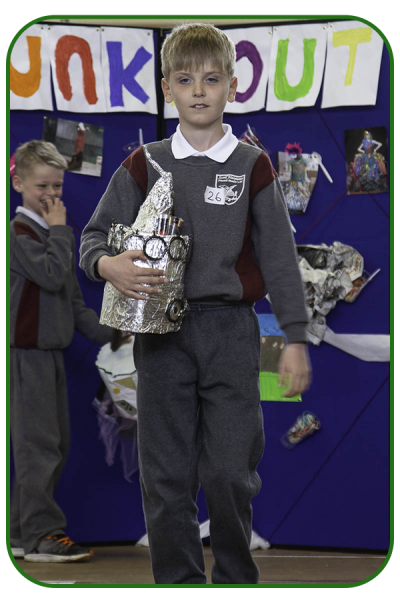 Tom Rodgers of Cheetah, The transition year students Joe and Seamus. 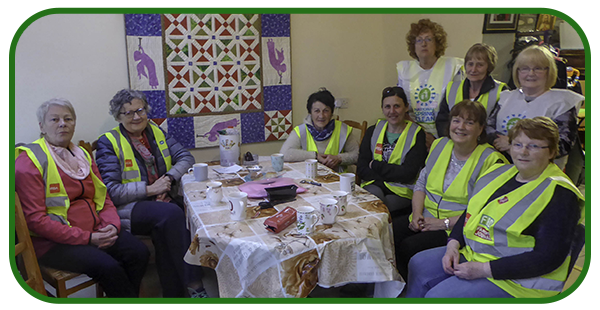 Siopa Glas volunteers especially Breda Wray and Marion Doyle. 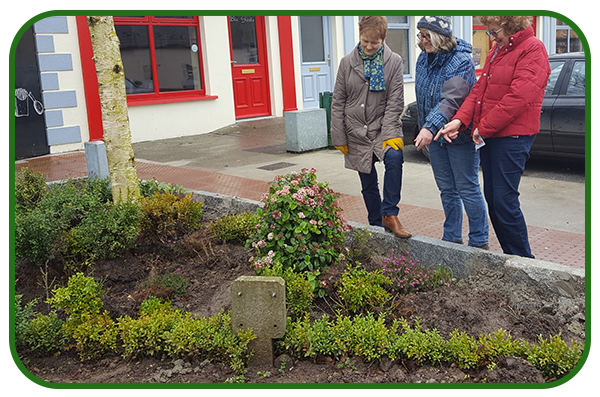 Kathleen Abbey, Sinead Abbey from the Tidy Towns Group. 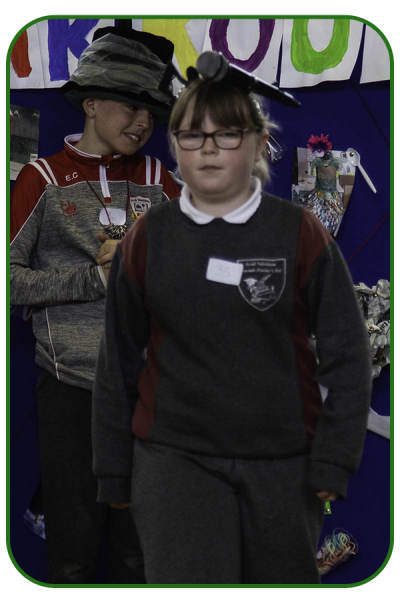 Local Photographer, Michael Martin, KCLR with Edwina Grace. 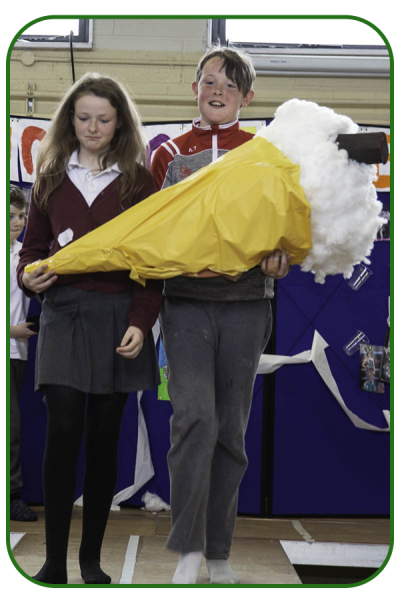 Michael Dawson, Ballon Community Notes for the Nationalist. 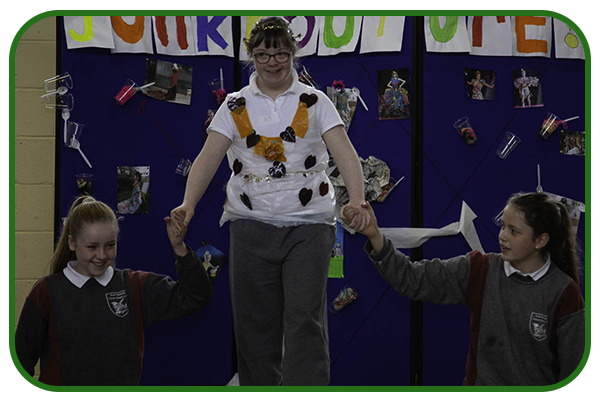 All who attended and took part in the many activities. 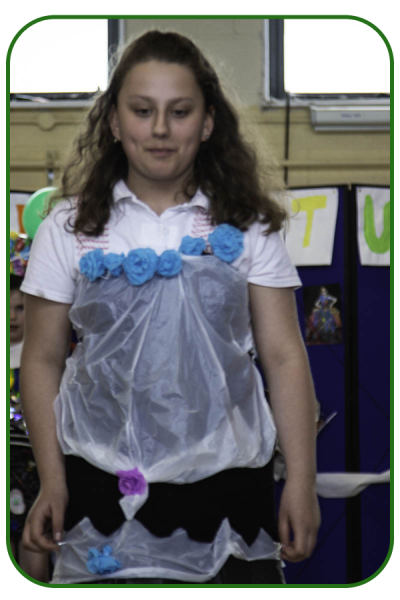 Please accept our apologies for any omissions. 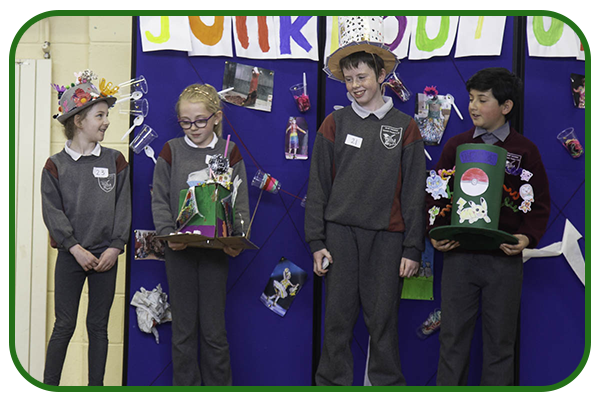 Front row L to R: Davy Francis, Odhran Maxwell, Adam Dowling, Eoin Fanning, Onyi Iroh, Charlie Clarke. 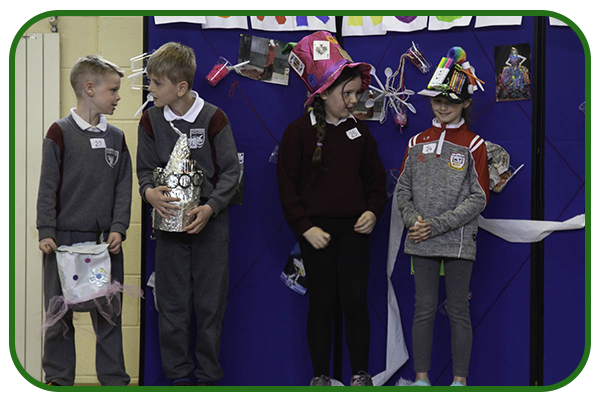 where chairperson, Máire George, in a very comprehensive repot, outlined the many and various activities carried out by the group during the year under review. 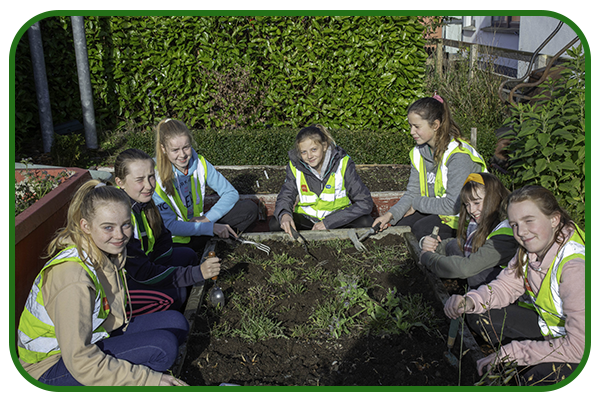 These activities included anything from litter picking, flower and tree planting to hosting a National Heritage Week event, organising a nature photographic competition, a fun bicycle day, putting up Christmas lights and applying for and getting some significant funding. 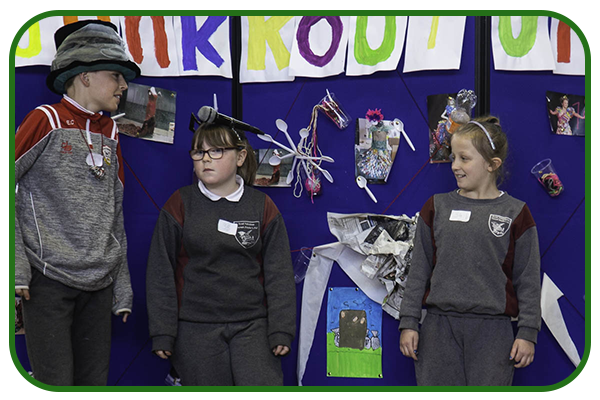 Topping the list in the latter category was getting a grant for €96K under the Town and Village Renewal Scheme. 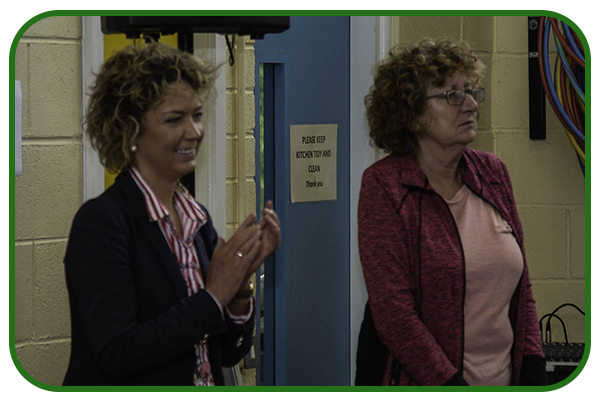 This money will be shared between the Training Centre and continuation of work on the tree and heritage trails and in particular signage for the trails. 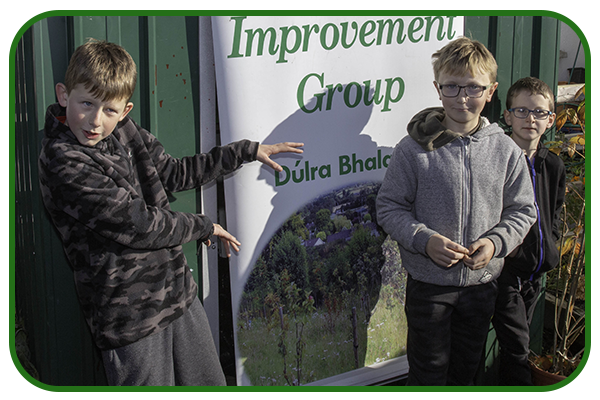 One of the biggest projects of the year came to fruition in May when Slí na Dúlra (Natures Walk) was officially opened by Cllr John Murphy. 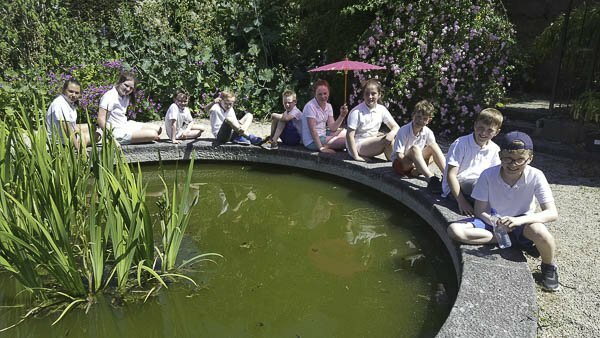 This little gem showcases hidden treasures in our village. 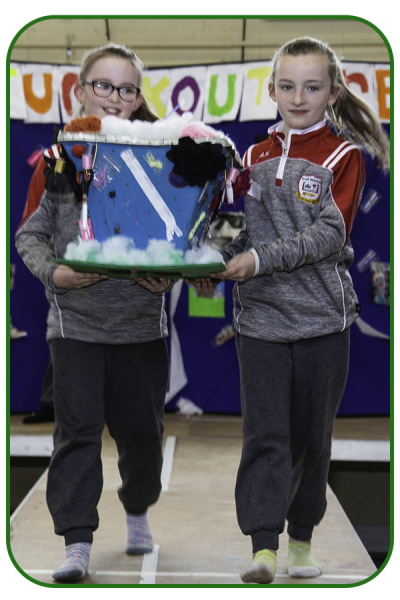 Siopa Glas was the main fundraiser for village enhancement during the year and thanks was extended to all who helped in any way especially the community shop volunteers and Tús workers. 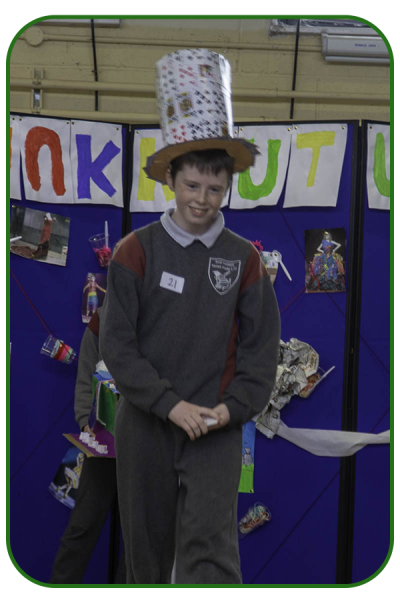 Thanks was also extended to Michael Martin for maintaining our very good village website www.ballonvillage.ie. 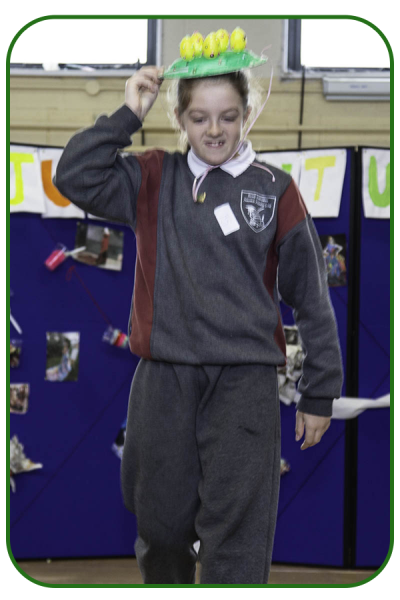 and to Eileen Murphy, Kathleen and Sinead Abbey and Bernie Mullins and anyone who helped in any way. 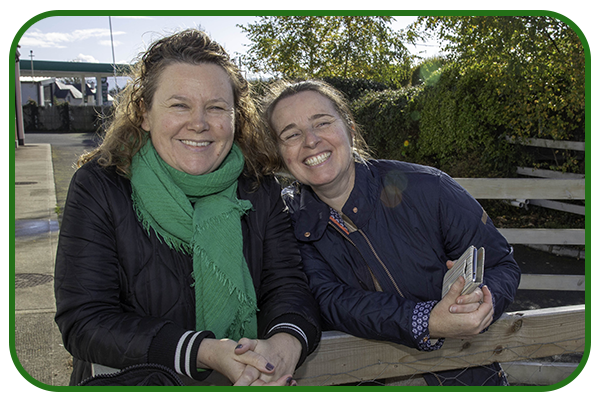 All three outgoing officers were returned for 2018 with Máire George as chairperson, Bernie Mullins as secretary and Eileen Murphy as treasurer. 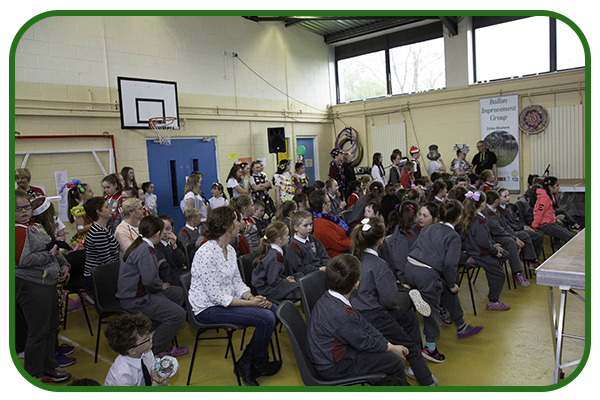 Betsy Hickey the Carlow Pride of Place judge visited Ballon this morning. 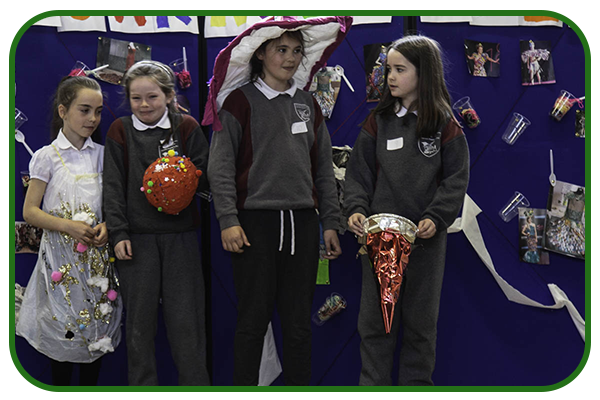 Pictured with Betsy, Margaret Buggy and Maire George. 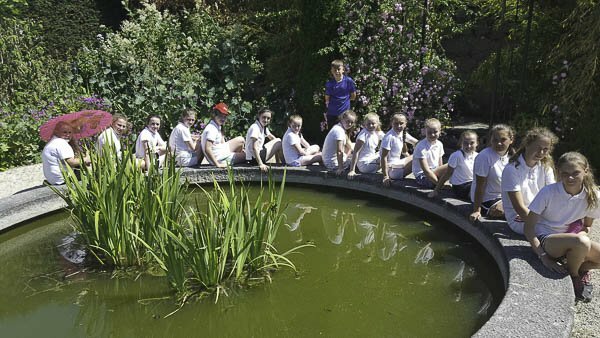 An hour long tour of the Village resulted on some good advice and tips for the coming season.